A research-based guide for educators to the practical methods of understanding, evaluating and facilitating the change process. 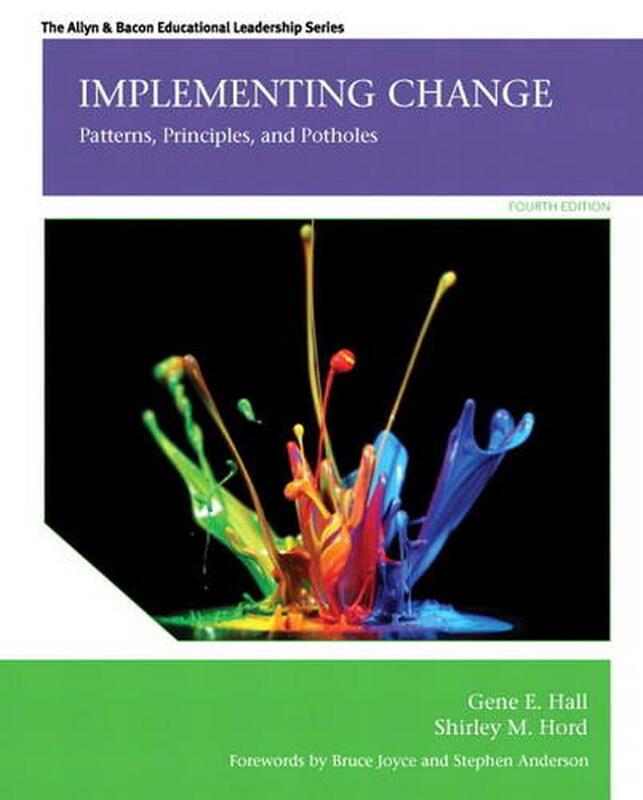 Significantly revised based on student and instructor feedback, the new Fourth Edition of Implementing Change continues to examine the ways in which change processes are experienced by those "on the ground" while adding new features, new material and the most current research. Based primarily on the Concerns Based Adoption Model (CBAM), this user-friendly text focuses on introducing constructs that can be used by those engaged in facilitating change processes as well as those who are evaluating and studying change. Rather than maintaining a bird's eye view of change processes, each chapter introduces a research-based, research-verified construct about change that captures the complexity of implementing change and the diversity of reactions to it. With a stress on pedagogical aids, each chapter incorporates practical examples, sample research, case studies, reflection questions and examples of common roadblocks to change. Gene E. Hall, Ph.D., School of Environmental and Public Affairs, University of Nevada, Las Vegas, has been a full professor at four universities and served as the Dean of the College of Education at two universities. Dr. Hall is internationally recognized for his career-long focus on developing new understandings about the change process in organization settings. He regularly serves as a consultant for schools, school districts, businesses, and state leaders on the implementation of various innovations and change processes from a Concerns-Based perspective. In addition to his work in the United States, he regularly collaborates with colleagues in other countries and serves on doctoral committees in relation to facilitating, evaluating, and studying change processes. His more recent research has examined relationships between Change Facilitator Style of leaders and outcomes such as increases in student learning. Dr. Hall has had a parallel academic career in regard to innovation in and national accreditation of teacher education. He is a co-author of The Foundations of American Education (Pearson) now in its 16th edition, and the lead author of Introduction to Teaching: Making a Difference in Student Learning (SAGE). Shirley M. Hord, Ph.D. was the first Scholar Emerita at the Southwest Educational Development Laboratory, and is currently Scholar Laureate, in association with Learning Forward (previously, National Staff Development Council). She authors articles and books on school-based professional development, school change and improvement, and professional learning communities. A sampling of her publications are Implementing Change: Patterns, Principles, and Potholes with Gene Hall; Learning Together, Leading Together: Changing Schools Through Professional Learning Communities, Teachers College Press (2004); with Patricia Roy, Moving NSDC's Staff Development Standards Into Practice: Innovation Configurations, National Staff Development Council (2003); Leading Professional Learning Communities:Voices from Research and Practice, Corwin Press (2008); and with Edward Tobia, Reclaiming Our Teaching Profession: The Power of Learning in Community, Teachers College Press (2012). In addition to working with educators at all levels across the United States, Canada, and Mexico, Dr. Hord serves as an educational consultant worldwide, in Asia, Europe, Australia, and Africa. Chapter 1 What Key Patterns, Principles, and Lessons Have We Learned About Implementing Change? Chapter 2 What Actions and Events Are Imperative in Facilitating Implementation? Chapter 3 How Can We Clarify the Change? Chapter 4 How Can the Different Feelings and Perceptions About Change Be Understood and Addressed? Chapter 5 What Are Characteristic Behavioral Profiles of Implementers? Chapter 6 How Do Leaders Make a Difference in Implementation Success? Chapter 7 How Does a Culture of Continuous Learning Support Implementation? Chapter 8 What Can Be Done to Understand a Part of the Change Process That Is Not Controlled by the Leaders or the Followers? Chapter 9 How Can Systems Thinking Enhance the Success of Change Efforts? Chapter 10 How Do Communication Activities and Change Agents Affect Implementation? Chapter 11 In What Ways Can Team Member Skills and Process Consultants Affect Implementation? Chapter 12 How Can Change Constructs Be Combined to Understand, Assess, and Lead Efforts to Implement Change?